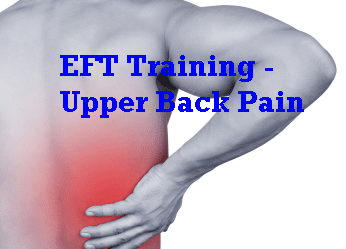 Here is another follow up to the post I wrote about Tony and how EFT was able to help give him relief from his upper back pain after his having surgery (Upper Back Pain Gone). The cause of Tony’s back pain was a skin cancer operation, which resulted in him having several scars, one of which was about ten inches long and angry red in colour. The operation had taken place about 4 weeks before the EFT Training session. The causes of his problem was not muscles or neck related. I thought it would be very useful to interview Tony in detail about his experience. I also thought it would be good to talk about the specific approaches from EFT that helped Tony. If you would like to see Tony explain in his own words what he experienced during the EFT Training then just click on this link. The interview is a follow up from this, which shows that at the point of interview the pain had remained gone. Tony did tell me that he has since gone back to the gym to exercise (and build his muscle strength:-) and is enjoying training intensively. He, at this point has greater range of movement in his arm and shoulder than he had prior to his surgery and upper back pain.